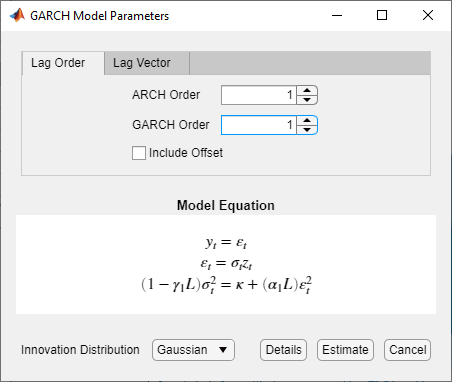 This example shows how to specify and fit GARCH, EGARCH, and GJR models to data using the Econometric Modeler app. Then, the example determines the model that fits to the data the best by comparing fit statistics. The data set, which is stored in Data_FXRates.mat, contains foreign exchange rates measured daily from 1979–1998. 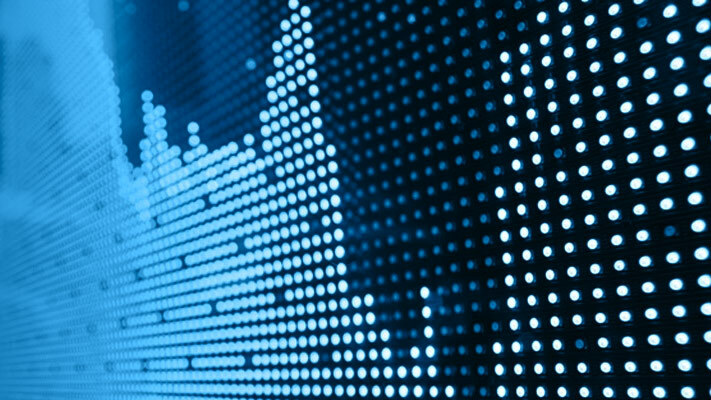 Consider creating a predictive model for the Swiss franc to US dollar exchange rate (CHF). At the command line, load the Data_FXRates.mat data set. Clear the row names of DataTable. Convert the sampling times to a datetime vector. Convert the table to a timetable by associating the rows with the sampling times in dates. At the command line, open the Econometric Modeler app. Alternatively, open the app from the apps gallery (see Econometric Modeler). On the Econometric Modeler tab, in the Import section, click . In the Import Data dialog box, in the Import? column, select the check box for the DataTable variable. 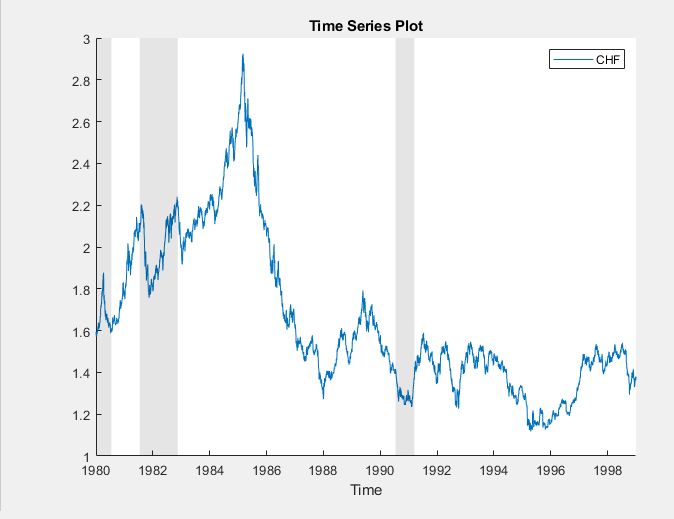 All time series variables in DataTable appear in the Data Browser, and a time series plot of all the series appears in the Time Series Plot(AUD) figure window. Plot the Swiss franc exchange rates by double-clicking the CHF time series in the Data Browser. In the Time Series Plot(CHF) figure window, right-click the plot. In the context menu, select Show Recessions. The CHF series appears to have a stochastic trend. Stabilize the Swiss franc exchange rates by applying the first difference to CHF. In the Data Browser, select CHF. On the Econometric Modeler tab, in the Transforms section, click Difference. 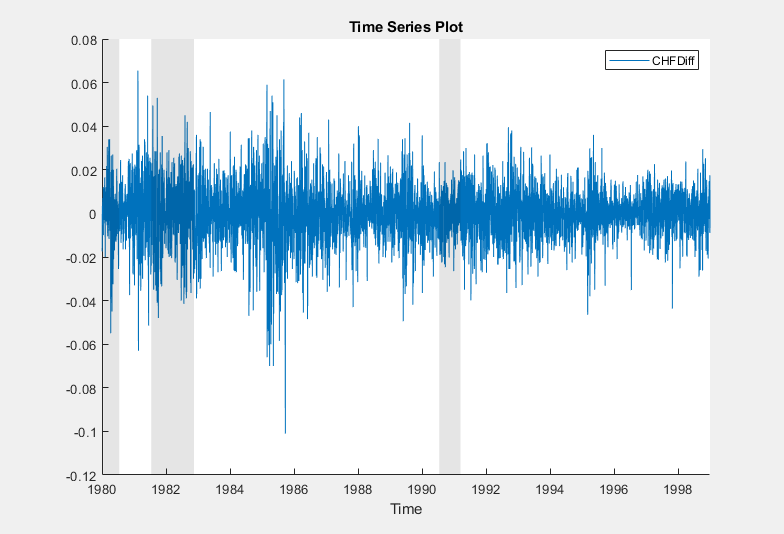 In the Time Series Plot(CHFDiff) figure window, right-click the plot. 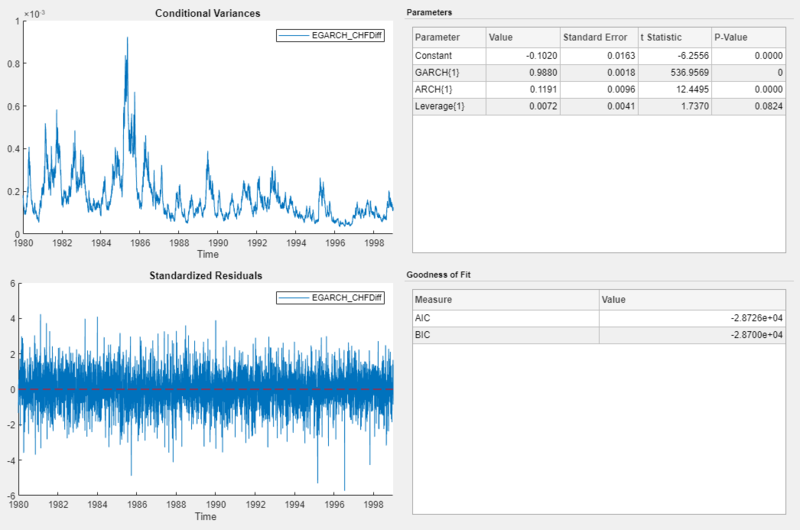 A variable named CHFDiff, representing the differenced series, appears in the Data Browser, and its time series plot appears in the Time Series Plot(CHFDiff) figure window. The series appears to be stable, but it exhibits volatility clustering. Test the stable Swiss franc exchange rate series for conditional heteroscedasticity by conducting Engle's ARCH test. Run the test assuming an ARCH(1) alternative model, then run the test again assuming an ARCH(2) alternative model. Maintain an overall significance level of 0.05 by decreasing the significance level of each test to 0.05/2 = 0.025. In the Data Browser, select CHFDiff. On the Econometric Modeler tab, in the Tests section, click New Test > Engle's ARCH Test. On the ARCH tab, in the Parameters section, set Number of Lags of 1. Set Significance Level to 0.025. In the Tests section, click Run Test. Repeat steps 3 through 5, but set Number of Lags to 2 instead. The test results appear in the Results table of the ARCH(CHFDiff) document. The tests reject the null hypothesis of no ARCH effects against the alternative models. This result suggests specifying a conditional variance model for CHFDiff containing at least two ARCH lags. Conditional variance models with two ARCH lags are locally equivalent to models with one ARCH and one GARCH lag. Consider GARCH(1,1), EGARCH(1,1), and GJR(1,1) models for CHFDiff. Specify a GARCH(1,1) model and fit it to the CHFDiff series. In the Data Browser, select the CHFDiff time series. Click the Econometric Modeler tab. Then, in the Models section, click the arrow to display the models gallery. In the models gallery, in the GARCH Models section, click GARCH. Set GARCH Degree to 1. Set ARCH Degree to 1. The model variable GARCH_CHFDiff appears in the Models section of the Data Browser, and its estimation summary appears in the Model Summary(GARCH_CHFDiff) document. Specify an EGARCH(1,1) model containing a leverage term at the first lag, and fit the model to the CHFDiff series. On the Econometric Modeler tab, in the Models section, click the arrow to display the models gallery. In the models gallery, in the GARCH Models section, click EGARCH. Set ARCH Degree to 1. Consequently, the app includes a corresponding leverage lag. You can remove or adjust leverage lags on the Lag Vector tab. The model variable EGARCH_CHFDiff appears in the Models section of the Data Browser, and its estimation summary appears in the Model Summary(EGARCH_CHFDiff) document. Specify a GJR(1,1) model containing a leverage term at the first lag, and fit the model to the CHFDiff series. In the models gallery, in the GARCH Models section, click GJR. The model variable GJR_CHFDiff appears in the Models section of the Data Browser, and its estimation summary appears in the Model Summary(GJR_CHFDiff) document. Choose the model with the best parsimonious in-sample fit. Base your decision on the model yielding the minimal Bayesian information criterion (BIC). The table shows the BIC fit statistics of the estimated models, as given in the Goodness of Fit section of the estimation summary of each model. The GJR(1,1) model yields the minimal BIC value. Therefore, it has the best parsimonious in-sample fit of all the estimated models.